So I haven’t really posted anything health related for a while, but I’m still very active in trying to change our little family’s eating habits to be more health friendly, and especially, gut friendly. 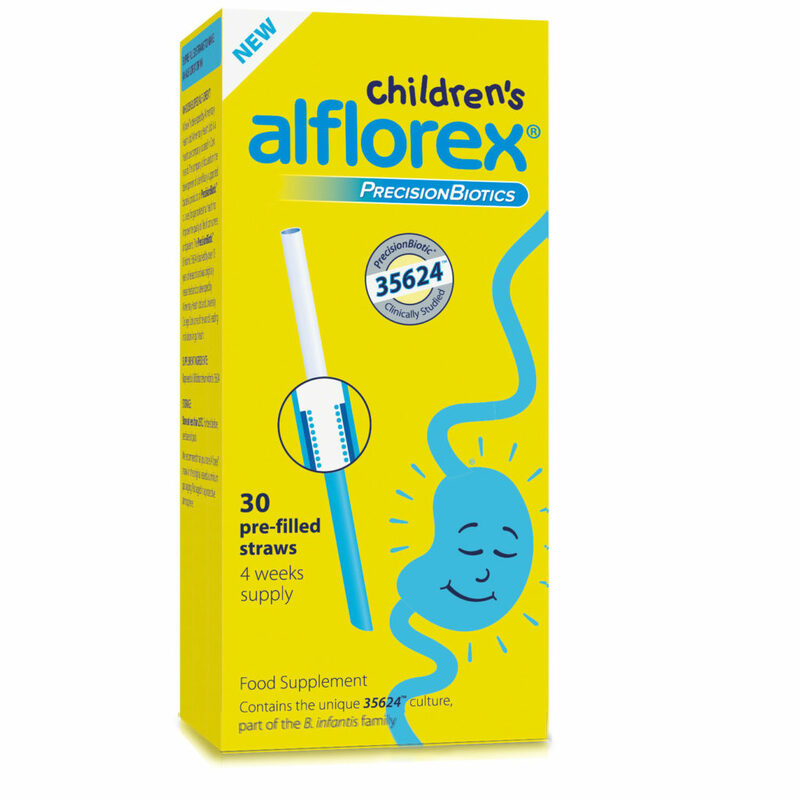 In 2014 I completed a review of Alflorex’s probiotics which were launched that year, and this year, when I received a press release that they were launching a children’s probiotic, I couldn’t pass up the chance to review it. Roz has been on different multivitamins and oils for a while, not for anything specific, mostly to just keep calcium, magnesium, vitamin D and other things in balance. She’s a very, very picky eater. getting better, but still not great, so these I hope, boost her system just a little bit. The great thing is that at least she doesn’t go green when it comes to taking any supplements. We usually go for liquids as opposed to tablets of chewy gus (teeth issues) so I was very pleased with the Alflorex supplement. The PrecisionBiotic 35624™ culture comes in a box with a thirty day supply of probiotics, with individually wrapped straws in silver foil. When the foil is opened, the straw telescopes out to a top white section and a blue bottom section. Very much liked in our house. The pre-filled straw delivers just the right dose of the unique PrecisionBiotic 35624™ culture, suspended within the straw. The oil itself is completely tasteless, and can be used with either cold milk or cold water. I tried one myself and can attest to the fact that it’s completely tasteless, and I am one picky eater myself so trust me on this one. Three sips of water or milk is all it takes to deliver the probiotic to your child’s digestive system, and then they can keep drinking with the straw to finish the rest of their drink. The straws don’t need to be refrigerated, making them very handy to keep in a cupboard or medicine cabinet. Roz already drinks any non-water drinks from straws to help minimise tooth decay, so the straws are quite an innovative idea and easy way of getting the supplements into her, and other children. The probiotic is currently retailing at €32.95 per pack containing 30 straws. I haven’t seen any in the shops, but have seen them online in health stores and pharmacies. As with all supplements, do speak to your doctor or Pharmacist if you have any worries about your health, but what I can attest to is how easy they are in comparison to tablets or capsules. Disclosure: For the purpose of this review, I was sent a box of children’s Alflorex PrecisionBiotics containing 30 straws. All opinions remain, as always, my own. Next story What the “white savior” doesn’t (care to) foresee.